Lahore: 06-12-2018: London Borough of Hounslow’s Mayor Ms. Samia Chaudhry called on Speaker Punjab Assembly Ch Parvez Elahi in the Assembly Chambers here today (Thursday). The Speaker apprised Mayor Hounslow about the history and parliamentary traditions of the Punjab Assembly. 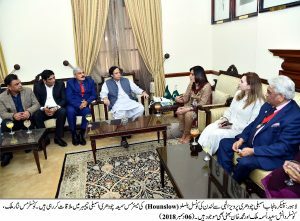 During the meeting Provincial Minister Hafiz Ammar Yasir, Secretary Punjab Assembly Muhammad Khan Bhatti, Councilor Ms. Nisar Malik, Councilor Danish Saeed, Nisma Malik, Ghulam Murtaza, Sajid Bokhari and Sajid Mahmood were also present. Ch Parvez Elahi said that Pakistan desires peace in the world and has paid very heavy price in the war against terrorism. He said that Prime Minister Imran Khan takes person in the peoples welfare, well-being and development works. Ch Parvez Elahi said that Usman Buzdar is the Chief Minister of the masses and he is doing very good work, if development works of our previous tenure were not stopped then condition of the province now would have been different, however, now these projects will be completed shortly now. The Speaker said that the government will provide conducive atmosphere to foreign investors for doing business. He said that our orange line train project was to be underground so that traffic on the roads is not effected. Ch Parvez Elahi said that we had undertaken reforms in the Child Protection Bureau to save the children for curse of beggary, during tenure of our government schools were established for the special children and for the first time in the history of Pakistan College for the blinds was established. 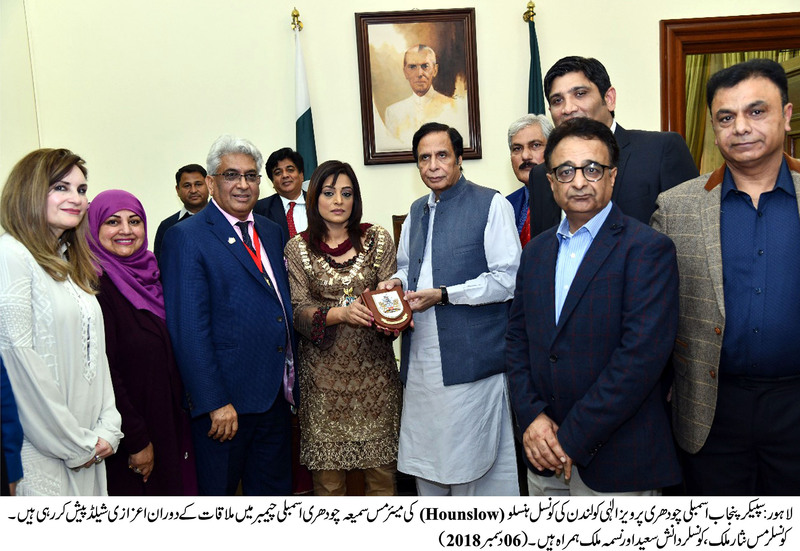 Mayor Hounslow Ms. Samia Chaudhry lauded the efforts of the government for the promotion of democratic traditions and for national construction and development. She also acquainted herself with the Rules of Procedure of the Punjab Assembly. She appreciated the establishment of Emergency Rescue Service 1122, provision of free education up to matric, stipends for girls and boys students and other development works undertaken during the chief minister-ship of Ch Parvez Elahi. She said that democracy is being strengthened in Pakistan with every passing day.